Before you start jumping to all kinds of wrong conclusions about me, let me tell you what I don’t do. I don’t bake my own bread. I don’t roll my own pasta. I don’t simmer my own stocks. I don’t make my own yogurt, cheese, beer, wine, or jam. I don’t grow my own vegetables or herbs. I have been known to churn my own butter, but if you knew how insanely easy that is you wouldn’t think much of it. I don’t, as a matter of course, can, pickle, bottle or preserve much of anything. While I might do any one of these things occasionally – purely for culinary kicks, mind you – if you assumed my fridge and shelves are full of anything other than what I bought at the supermarket last time I was there, I’m sorry to say you’d be sorely, sadly mistaken. I’ve told you all this not because I’m looking for your sympathy (or scorn), but so you can better appreciate the following. 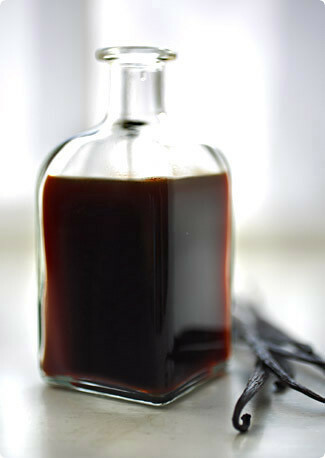 I do make my own vanilla extract, and if I can do it, I’m pretty sure you can too. It’s funny, my vanilla-making started without the fanfare of many of my other culinary projects. This spring’s sourdough project, for example, required a level of planning, commitment and meticulous attention to detail more akin to building a nuclear bomb than cultivating a bit of fungus in a bowl. And while after completing Nancy Silverton’s gruelling two-week boot camp of precision-timed twice-daily feedings I felt proud as a new parent when my first little loaf actually rose in the oven, that couldn’t keep me from abandoning the poor starter to its fate in the back of the fridge a few months later. Preserve-making is another sad story; after forcing myself to get over my fear of canning one fateful day last year, I naturally assumed I would be canning up a storm every summer for the rest of my life, and quite possibly never buy mass-produced jam again. How has that gone, you ask? I think you know the answer. But this vanilla thing, it all started so innocuously. So innocuously, in fact, that I didn’t even know what I was doing until after I had done it. A couple of years ago, you see, I made my first bulk purchase of vanilla beans through the internet (at what I thought then must be misprinted prices), and all of a sudden I had a problem I’d never faced before: a growing pile of used beans that were still far too fragrant to throw away. I tried sticking them in sugar like everyone suggests, but I was going through beans so quickly that I ended up infusing every bag we bought, and I grew tired of having to run out to the store every time I wanted a pinch of non-vanilla-scented sugar to stick in my pasta sauce. I had a bottle of light rum on the shelf, though, and this brilliant idea hit me that if I stuck a few beans in the rum, after a few months I might have a very interesting cocktail mixer – maybe even one I could give as a gift, with a cute hand-printed recipe for a vanilla mojito or something. So I put a few spent beans in the rum, stuck it back in the cupboard, and pretty much did nothing to it except open it every so often to throw in a new bean. I noticed the color getting darker and the aroma getting stronger, but it didn’t hit me until about five months later when I finally decanted some that what I had actually made was not any vanilla-flavored booze, but a ripe, powerful and intoxicatingly fragrant vanilla extract. I quickly finished up my trusted Nielsen Massey and started using this in its place, and wouldn’t you know, it was every bit as good, if not even better! I ordered more vanilla beans – Tahitian ones this time – and kept adding my spent ones to the bottle, topping the liquid up every now and then with whatever mild alcohol we happened to have on hand, and as the months passed the flavor grew stronger, bolder, more complex. That was a year and a half ago, and I’ve never looked back. I feel a bit silly trying to convince you that you too can easily make your own homemade vanilla extract, like Nancy Silverton convinced me I could have bread as good as hers coming out of my oven every weekend when what would actually happen is that I would spend weeks creating a living thing only to have it end up in the trash, but really, I can’t stress enough how easy this is. If you use vanilla beans regularly – and I’ll give you a couple of sources for cheap ones in a minute – there’s no reason not to; it’s effort-free, it’s more versatile than vanilla sugar, and it makes really great gifts (maybe even better than vanilla flavored rum!). And the best part? If you forget about it for a couple of months, it doesn’t shrivel up and die, it actually improves. I’m not quite sure what it says about me that the one project I’ve had success with is the one that actually requires neglect, but hey, as long as there’s great vanilla coming out of it I’m not going to sweat the implications. There are probably easier ways to do it, where you just use a set ratio of beans to alcohol and let it sit until ready. The beauty of this method, however, is that a) aside from the very beginning, you’re only sticking used beans in there (which feels delightfully frugal), b) your extract will continue to improve as you keep adding new beans, and c) once you get the ball rolling, as long as you keep using vanilla beans in your kitchen you’ll have an unending supply of extract on hand too. Pretty nifty, no? 1. Find a supplier of good, cheap vanilla beans. I buy mine from the San Francisco-based Vanilla, Saffron Imports, whose beans I can highly recommend (though interestingly enough, I haven’t been all that impressed with their extracts); another good option is eBay; try The Organic Vanilla Bean Company or Vanilla Products USA – or just search for ‘vanilla beans’ to see all your local options. All of these companies will ship anywhere in the world, though the eBay sellers are probably the cheapest for that. I usually buy 1/2 lb. at a time (about 60-80 beans, depending on variety), which lasts me for about a year, depending on how much baking I do. If you can, get a mixture of Bourbon (Madagascar) and Tahitian beans; I usually prefer the Bourbon’s flavor, but a mixture makes a very nice extract. 2. Buy two 4-oz (118ml) jars of vanilla extract – something good and strong, like Nielsen-Massey, Penzey’s, etc. Trader Joe’s is fine too. Just make sure it’s real vanilla extract, not some nasty cocktail of chemicals. Now, put one on the shelf and start using it. Yes, it’s going to take a while for your homemade stuff to be ready, and you’ll need something to tide you over. Sorry, there’s no way around it! The other one you’ll be using to kickstart your homemade stuff. If you live in some remote corner of the planet where you can’t buy vanilla extract, I’m afraid you’ll have to skip this step. Your homemade extract will take a while longer, but it will still be good. alcohol. Nothing fancy, just the cheapest stuff your supermarket sells. Some people shy away from booze with its own flavor, but you’ll be using it in such small quantities that it really won’t make a difference, though if you’re worried about that just use vodka. Again, put one bottle in the cupboard (no, this one is not to tide you over, so hands off!). This is your ‘top-up’ bottle which you will start using once you start decanting your own extract. You can, of course, buy the second bottle later, but it never hurts to be prepared. 4. Find yourself a 1 quart/liter glass container with a lid such as a mason jar, an old booze bottle, etc. Clean it well. Make sure it doesn’t harbor any weird odors. 5. Pour one bottle of store-bought extract and one bottle of booze into the container. Now you need to add some vanilla beans. If you’ve already got some used ones lying around, lucky you – use those. If you don’t, you’ll have to sacrifice some new ones. How many you put in to start with is completely up to you; the more you put in the faster your extract will be ready. I think I started with 4-6 new ones, and added 3-4 used ones per month after that. Split them down the middle and throw them in. Put the lid on tightly, give everything a shake, and put the container in a cool, dark cupboard somewhere. 6. Carry on with your normal life, using both the extract on your shelf and your vanilla beans, only that every time you use a vanilla bean, throw it in the container afterwards. If you’ve simmered the bean in milk or something for your recipe, give it a good rinse first. Take the container out and shake it around once a week or so, at which time feel free to poke your nose in and see how things are developing. It will start out smelling powerfully like alcohol, but over time, the vanilla flavors will take over and the boozy smell will almost disappear. 7. Continue doing this for, oh, at least 6-8 weeks. The longer the better. Of course YMMV depending on your personal consumption habits, but what we’re aiming for is that by the time you’ve finished that bottle of store-bought extract on your shelf, your own should be rich, fragrant and ready to start decanting. The other reason to wait until you’ve finished the supply on your shelf is that you can use the handy little bottle for your own extract. What a great idea for Christmas presents! If I get on this now, I could have a few little bottles to give away… Thanks! Wow! didn’t know it was this easy to make. Thank you for sharing! I think you’re going to give Nielsen Massey a run for their money! I’ve often pondered starting some of my own vanilla extract as I use a ridiculous amount of vanilla beans but I’ve always been slight afraid. You’ve encouraged me! I had been meaning to give this a shot. My mom arrived with some ends of vodka my grandpa keeps bringing to her house…so I have the booze. And a friend just hooked me up with some fantastic beans. I’m on it. Right away. Thank you. There. It took 5 min. Done. Thanks again! Thank you for the links!!!! Good cheap vanilla beans are so hard to come by : ). Very nice recipe indeed. And don’t feel guilty about not making your own jam, there are plenty of very good quality ones out there ; ). One question, is your article about Belgium in the latest number of Food and Travel. It’s out now but I only buy it when there is something that catches my eye and I could not see anything about Belgium when flicking through it. as I live in Munich, Germany (not so remote, but still devoid of vanilla extract), this is a godsend! since I have no starter extract, should I just substitue extra alcohol, or omit it entirely? Ales – The Belgium article is in the October issue, their special 100th anniversary one. You can see the cover on their website (and in my own ‘this month in print’ section down right). That said, maybe the November issue is already out…?Audrey – Ah yes, extract-less Germany. I’d forgotten! I wouldn’t worry about substituting extra alcohol. It’s not an exact science 🙂 You might want to start with more beans, though, to help it gain strength faster. Maybe 10-12? Have actually never used vanilla beans, though I’ve often been intrigued by recipes calling for them…thanks for pointing us toward cheap sources! Vanilla extract would make a great gift, though the new no-liquid airlines policies might make transporting little bottles of extract for the holidays difficult… Hm. Well, I may buy myself some beans & start making extract in any case! Thanks for the post. What a great idea! but I have a question, what if you stick the vanilla beans in a fruit alcohol, like Calvados (apple) or Cointreau (orange), do you then have a vanilla-apple extract or a vanilla-orange extract? because that would be utterly cool. Hilda – I haven’t tried that myself, but I *suspect* that the apple/orange flavors in those liquors are not strong enough to be detectable in the kind of quantities you’ll be using the extract, e.g. a teaspoon here and there. It might be possible to make, say, a vanilla-orange extract by throwing a few orange peels into your mixture, but I would definitely research it more before doing so. Who knew making vanilla extract was so easy?! Thanks for sharing the method. This will definitely be on my to-do list for the next rainy day. Thankyou for the online shooping idea – the other day I was despairing at the prices of vanilla beans in stores here (Portugal). I went on ebay, scouted around a bit and – score! Now I just have to hope that the quality’s good, and start looking around for more vanilla recipes. Fantastic idea. So, the extract never goes bad, does it? Also, is it still alchoholic? Can I use it in cocktails? this is amazing! thank you for sharing–so practical (thrifty) AND delightful! My aunt gave me this bottle called "everlasting vanilla" once. It had vanilla beans in it and instructions to fill it with vodka and such. I was convinced it would be awful, so I used the beans and chucked the bottle. Now I stand corrected!! I think this is one of your most well-written posts– absolutely delightful. I might consider making vanilla extract, but as somebody who cooks a good deal but has never touched a vanilla bean, I must ask: How do you go through so many? What should I be cooking if I want to have my own ready stash of used beans for the vodka bottle? And how "used" can a vanilla bean be and still be reusable? I thought about doing this for a few years now and had seen those beans on ebay but your step-by-step tutorial has convinced me and I have just the old brandy bottles to put to use! Hilarious read, nifty recipe plus wonderful photo – your blog is simply one of my all-time favourites! This is brilliant! Absolutely brilliant! I just ordered my vanilla beans – I can’t wait to try this! This looks so easy and perfect for gifts! I have one question, however: I have never used or needed vanilla beans in a recipe. I can still make this just straight, right? Or do I need to remove the seeds before sticking them in the alcohol? now that’s a great idea… i have a dozen half-empty bottles of booze standing on the wine fridge and been wondering what to do with them. nobody’s going to drink all that spirit and they’re not great for cooking – but vanila extract might be just the thing. with christmas coming up, i’ll have even more vanilla beans hanging around and although I do it like vida, namely blitz the entire beans with sugar for vanilla sugar, there’s only so much of it that i can use… thanks for this! I’ve been wanting to make my own vanilla extract for a while now & you’ve inspired me to go ahead with it. And just in time for Christmas gifts. Thanks! I had the same bulk purchase of vanilla, and for a while now it´s been a vodka bottle of vanilla extract. so wonderful. rum was probably a better idea but I went with the barefoot contessa instructions. yours next time! I love projects which require neglect and have been making ratafias-3 so far, nectarine, plum, and fennel ones. The method is very similar. I just fear I may forget one completely, in the back of the fridge. (They need to be cool for the vegetable matter involved. )Even if I don’t make this-and I’m considering it seriously, I’m taking your advice about buying vanilla beans in bulk.Why did this never occur to me? I’ve always known it was easy but never thought about doing it. Your article has motivated me! Now it’s time to buy some beans from ebay. Thank you! i love u..u have NO idea 🙂 it’s been a long time since i typed in your url in my browser window.. somehow i forgot that yours was the first food blog i fell in love with.. n now that i’m back, and reading this post, i am reminded that first loves can’t be forgotten that easily.. where may i ask do u order vanilla beans in bulk? i bake a lot and am dying to try making my own vanilla extract.. thanks! Dear Melissa,I have made many of your recipes and they have always turned out really well. Congratulations, on a great blog. I am definitely trying the vanilla extract. I have been an ebayer for years, but never thought of buying vanilla on line. What an eyeopener. I was paying 1.20 euro per bean!! Thanks for everything. Is having used vanilla beans mandatory or can you use unused ones as well? Fantastic! Since I bake my own bread — and pickle — I can’t see any reason why I shouldn’t make my own vanilla extract. To my friends, this will look like I’m a total kitchen-fanatic. Great! Thanks for a lovely blog. LOL. I followed, and photo-chronicled, Nancy’s starter directions too…for weeks…until it dawned on me that the original La Brea bakery (where they still make loaves…) is a 3 minute drive from my house…at which time I went and bought a few loaves. Kudos to you for actually baking the bread! As for the vanilla…you are right, its a snap to do, and Im glad to see you recommending it! I went and bought myself 1lb of vanilla beans. Now i’m starting to worry if custom will detain my beans!! Let’s hope i get it next week!! BTW, It’s a fantastic post! I appreciated this how to. Thanks so much.Would the process be the same for lemon extract? Melissa- this was such a hilarious/enlightening post and quite timely. My family has decided to do homemade gifts this year: not less time consuming than shopping, but much more fun, and I’m definitely including some homemade vanilla (per your instructions) as part of my gifts. I just started my own big Mason jar this afternoon, and away we go… Thanks for sharing such a fun discovery! WOW~!Thanks so much for this one ~ I’ve made Liquors with vodka and flavorings but never thought of Vanilla!As my source from Mexico has gone dry.. [ie: doesn’t travel anymore ;~( ] this is a godsend!Wonderful site and for a first time reader.. great food! I do love a project. Great idea Melissa. And loving the idea of buying vanilla beans in bulk. Do you have any plans to experiment with other extracts?? Love the pic too. Brill! !Xmas pressie for fellow foodies now done and dusted!!! I started reading your blog a few months ago when Mark Ruhlman put a link to your cultured butter recipe. I fell in love, and started making my own butter (which is easy and tastes primo!). I saw your vanilla post on Thursday last and immediately ordered 1/2 lbs of beans online and am awaiting their arrival. I thank you for your excellent writing and your easier than dead easy recipes. They make me feel like a domestic genius. What a forehead-smacking moment! What a great way to work those beans for all their worth…. (wait, that doesn’t sound right!) Hahaha!Thanks for sharing, what a wonderful project for those of us who have less patience for those fussy kitchen things! *Runs off to buy more beans. Here via Craftzine.We’ve been doing this largely for the same reason you started, because damn it seems like such a waste to throw those "spent" beans out. Except that we use top shelf Bourbon. And we don’t use it for v. extract. We use it for drinks!Now, the Vanilla Bourbon is a hit at all the parties. It really works well in diet coke. YUM. Love this idea! I’ve gone to e-bay to buy the beans to put in the rum to decant into these cute bottles I’ve been collecting to make the vanilla extract to give as Christmas 2007 homemade by me cause I love this idea! Melissa, I too have been making my own extract for a while now. I actually just finished some. Can be a bit addictive. 🙂 But I love to do it and it is so easy. I keep vanilla beans in bulk as well which I buy very cheap on ebay and the quality is excellent. My extracts come out very strong. I actually have a bottle of Neilsen-Massey which I’ll probably use in more of my homemade extract. You have a great post on this top. Thanks. I take 1.75 liter bottle of cheap $15 vodka to which I add 40 Grade A Gourmet 7" Bourbon PNG (Papua New Guinea) vanilla beans. Gourmet, Grade A or Prime beans are premium, chef’s quality beans – plump and full of moisture. Split open each bean lengthwise and scrape out beans with spoon. Add beans and then entire scraped pod to vodka. Cap and place in cool, dark place. Shake bottle every month. Wait two to six months. If you desire, strain to remove beans and pods for clarity. Extract should be very dark and you should barely be able to see through it when you hold it up to the light. As Jamie Oliver would say: Easy-Peasy. Rule of thumb: Use at least ten beans for every pint of extract. This will ensure a strong extract. I purchase my vanilla beans from Vanilla Products USA on Ebay. Last purchase was for one lb (approx. 100 beans) at a cost of $25 plus $5 shipping. Trust me – you’ll never go back to store bought again. Plus, you’re saving tons of money ($15 in beans=1.75 liters of vanilla extract). Thanks to your post, I won a half-pound of beans from Vanilla Saffron Imports in a contest at Steamy Kitchen! (Everyone listed something they’d like to make with the vanilla, and then winners were drawn at random. I listed your extract.) So thanks!I’m back to double-check on how to get the extract started. Do you recommend sticking with one kind of alcohol? I’ve got both vodka and rum I could use, and I’m wondering if I can mix them or if that would just taste too weird. Great recipe! I also love to make my own extract and have found it to taste so much better than regular store bought extracts! I also wanted to suggest using a company called Beanilla.com to purchase vanilla beans. They have several different types of beans to purchase, which is fun to test and compare! I currently in the middle of making both a have a batch of Madagascar vanilla extract and a batch of Mexican vanilla extract! How do you use so many vanilla beans? I have never used one. Do you have recipes?? Dear Melissa,it has been a while now since I followed your advice, ordered my vanilla beans and started making vanilla extract. The exctract is doing really well, it is my beans that are in trouble. I ordered about 80 of them from one of the sources that you mention above, I stored them in a plastic bag tightly wrapped and placed themin a dark cool place, but what do you know: THEY HAVE MOULDED!!! It is just their tips that are mouldy at the moment but I have about 60 left so it is a pity. Any ideas of what I should do to save them? Foodjunkie: First of all, are you sure it’s mold? High-quality vanilla beans sometimes develop small white spots that are the result of the vanillin crystallizing out. If you’re sure it’s mold, i.e. it’s large and fluffy, this site says as long as it’s confined to the outside of the bean it can just be washed off. If it’s penetrated the inside, however, you should probably cut off the affected parts – or even (gulp!) throw the beans away.Where do you store your beans? Contrary to some advice I keep mine in the fridge, and I’ve never had a problem with mold. I do, however, get lots of those white crystals. THANK YOU!!! I am new to a raw food diet… and vanilla beans seem to be a favorite ingredient in most of my un-cookbooks. I was spending scads of money of vanilla beans. Your link to the vanilla bean company has saved me! Now I can drink my yummy smoothies without an ounce of guilt! I, too accidentaly made my own vanilla extract. I happened upon a store that had mistakenly priced their vanilla beans at $1.69 a pound instead of each. Of course, I bought at least a pound. Then, I worried that they would dry out, so i put them into a quart canning jar and filled the jar with vodka. Now 5 years latter, every time I need a vanilla bean, I just pull out a booze-soaked one, split it, and enjoy. Plus, the extract is fabulous. Very nice article. I will have to include something like this on my vanilla web site. This is very useful information! Awesome, incredible references by the way, can’t thank you enough. We are starved for good vanilla beans here in Denver, you can’t believe how much they charge for anything decent. I love the photo. After making my own, I could never go back to store bought vanilla extract. Hi! I saw this on Pinterest and just love your vanilla extract. I am currently having a bottle in the cupboard too and just can't wait for it to be matured enough to use! Well, I saw a catalog selling something called "everlasting vanilla." It was pretty expensive, but I loved the idea. So….I started looking around online and seeing what I could find out about it. And so, here I was. Thanks for all of your wonderful words. I'm going to do it! Look out, friends and family. Guess what you're getting for Christmas! I think I'll give bottles and offer to refill them for my favorite people! Whoopee! New inspiration!